Building an emergency fund is key when you’re ready to start taking your finance seriously. While I personally recommend saving a full three to six months of expenses in an emergency fund, I don’t think that should be your first emergency fund goal. Instead, I agree with Dave Ramsey on this topic. I think you should work to build a $1,000 emergency fund first. Having access to $1,000 could stop you from incurring debt for most minor emergencies such as a flat tire, having to pay a car insurance deductible or even an urgent care visit. Without $1,000 in the bank, emergencies like these are often paid for with debt that you have to pay interest on. 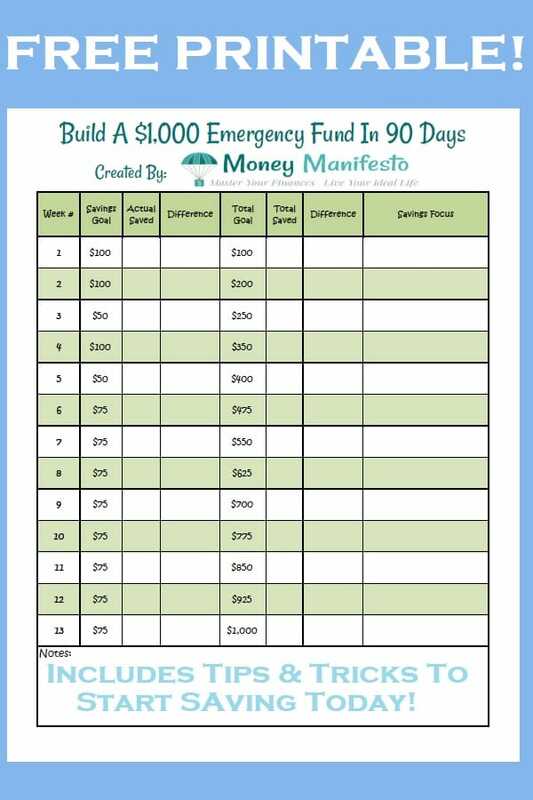 So, how do you set up an emergency fund and fill it with $1,000 in 90 days or less? This will be easier for some people than others, but I firmly believe anyone with enough determination can make it happen. The first step to saving a $1,000 emergency fund is saving the first $100. For many people, this will be the hardest part. You’ll have to make the mental shift from spending all of your money to saving some of your money to better your financial future. It’s totally worth it, but it can be tough to make the transition. 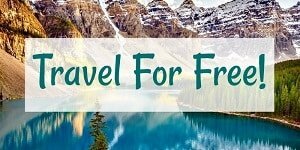 Why save $100 first? Saving $100 is a nice landmark number. Additionally, the $100 you save will be enough to open a savings builder account at our favorite emergency fund bank that doesn’t charge you any monthly service fees on your savings. After you’ve saved your first $100, it’s time to Open a Savings Builder High Yield Savings account and get a 2.45% APY. See site for full terms and conditions on this offer. Why CIT Bank? First off, you probably don’t keep your checking account at CIT Bank. CIT Bank is an online bank that has been growing in popularity and offers some pretty awesome interest rates on their savings builder accounts. How awesome? If you have a local bank or credit union, chances are CIT bank pays at least 10 times more interest than most brick and mortar banks. After you’ve saved up your first $100, you can Open a Savings Builder High Yield Savings account and get a 2.45% APY. See site for full terms and conditions on this offer. Do you have to use CIT Bank? No. However, I highly suggest you start your emergency fund account at a bank separate from the one you do most of your banking at. This way, it will add another obstacle so you don’t get tempted to spend the money you’ve saved in your emergency fund. If you don’t go with CIT Bank, make sure the bank you choose offers a no-fee account so your emergency fund doesn’t slowly decrease in value. Also, make sure the account you choose pays a decent interest rate. It’s easy to transfer money out of CIT Bank to your usual bank account if you need it, but it requires logging in and transferring the money which is usually a big enough obstacle to prevent you from spending the money on everyday expenses. Your journey isn’t over after you’ve saved your first $100 and opened your CIT Savings Builder account. In fact, it’s just getting started. You still need to save another $900 to reach your $1,000 emergency fund goal. While saving another $900 probably seems daunting, it’s totally doable. I’ve created this handy printable that shows how much you need to save each week over the first 90 days to reach your $1,000 goal. 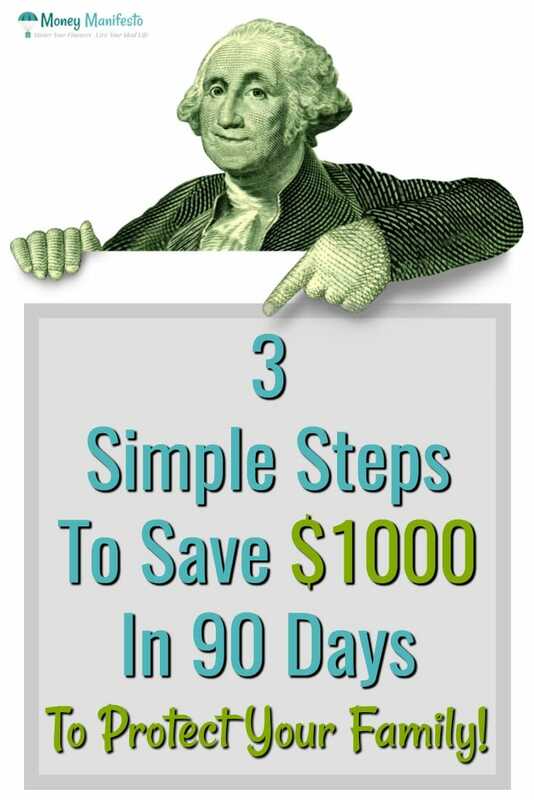 Click here to download the Save $1,000 in 90 days printable for free. All I ask is that you pin the above image to Pinterest. Now that you have your free “Save $1,000 In 90 Days” printable, let’s explore how you can hit your savings goals. I’ve created this printable with your best interests in mind. While it’d be easier to simply say save $76.92 each week to hit your goal, that doesn’t take your personal situation, psychology and money habits into mind. Instead, I’ve created the following guidelines to give you the best shot at success. Week 1 is the most crucial week for your $1,000 emergency fund’s success. No matter what it takes, you need to work to save your first $100 so you can open your emergency fund account. Week 1 is also the time you’ll be most excited about your new goal. That’s why we set the goal at $100 rather than an even $76.92 each week. After we share the rest of the schedule, we share tips on how to save your first $100. During week 2, you’re probably still super excited about getting your emergency fund fully funded. Take advantage of this excitement and aim to save another $100 and deposit it into your emergency fund account. By week 3, you might be wondering what you got yourself into. How in the world can you continue saving $100 every week? Thankfully, this week you only need to save $50 to stay on track. Give yourself a small break to celebrate your success so far, but don’t drift back into the bad money habits you banished in weeks 1 and 2. During week 4, you’re probably feeling a bit better after last week’s break. For that reason, it’s time to get intense again and aim for another $100 savings week. By week 5 you’re probably getting more used to the effort it takes to save money. You’ve built good habits, but you might need one more tiny break before you set up a permanent savings plan. Use this week to work out any last minute tweaks you need to make before you start the $75 weekly savings goal you’ll need to hit in weeks 6 through 13. Now that you’ve been saving for 35 days, you should have a good handle on how you’ll be able to save on a regular basis. To hit your $1,000 savings goal in 90 days, you’ll need to save $75 each week from week 6 through week 13. At the end of the 90 days, you’ll be a rockstar with a $1,000 emergency fund. Whether you’re struggling to save your first $100 or you need to come up with a way to hit week 10’s $75 goal, we’ve got you covered with a few tips. 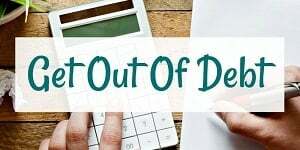 Here are a few detailed ideas on how you can start saving money or earning more money in addition to several posts that can help you accomplish your weekly savings goals. There are an unlimited number of ways you can earn more money. The best part is, your earning potential is technically unlimited. While cutting back on expenses can give you quick wins, building extra income is freeing. If you’re sick of people telling you to cut back your lifestyle, here are a few ways you can earn more money. Will You Accept The Extra Income Challenge? If you work an office job, chances are you want to get out of the office for lunch. That usually means eating out. Unfortunately, eating out every day at lunch can get expensive, fast. Instead of eating out, pack your lunch and head to a local park to eat. Yes, it is a sacrifice, but building your $1,000 emergency fund is worth it. By the end of the challenge, you can start eating out for lunch again if you don’t get used to it. However, if you do get used to it, you can save a ton of money going forward. Let’s say the average lunch out costs $10. If you instead pack a lunch for just $2.50 per meal, you’re saving $7.50 per day or $37.50 per week. Be creative with your packed lunches. If you pack leftovers that you would have otherwise thrown away, you essentially save the whole $10 for that day. By the end of 13 weeks, you will have saved $487.50 toward your emergency fund just by packing your lunch. Do you use Verizon, AT&T, T-Mobile or Sprint for your cell phone carrier? If so, you could potentially save money by switching to an MVNO. Essentially, MVNOs rent the big four carrier’s cell tower network to offer service. For the most part, your MVNO offers the same service as the rented network. However, if you don’t use a lot of minutes, text or data or your big four carrier simply chargers you too much, you could save a lot of money by switching carriers. If you save $20 per month per line, a couple could save $40 per month and $120 over the 90 days to put toward their emergency fund. Read more about MVNOs here. You can also check out my favorite MVNO, Republic Wireless here. I’m not going to tell you to cancel your cable completely to fund your $1,000 emergency fund, but if you were thinking about it any way you might want to pull the trigger for maximum savings. However, if you’re like me and love your cable package, you don’t have to cut it completely. Instead, call and negotiate to get the best deal on your cable package. 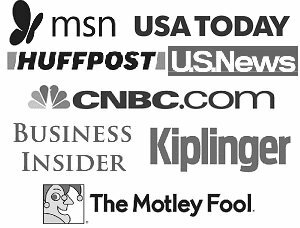 If you haven’t called lately, you could probably easily save at least $25 per month or $75 over the 90-day course of the $1,000 challenge. Check out these tips on negotiating your cable bill. The above three ideas are just the tip of the iceberg when it comes to saving money. Want even more tips? Check out these posts. There’s nothing stopping you from starting your 90-day journey to a $1,000 emergency fund. Save your first $100 then Open a Savings Builder High Yield Savings account and get a 2.45% APY. See site for full terms and conditions on this offer. Click here to grab the free printable. Remember, all I ask is you pin an image from this post on Pinterest in return. What’s your biggest challenge to saving a $1,000 emergency fund in 90 days? What ways are you spending less and earning more to make it a reality? Share your ideas in the comments below.